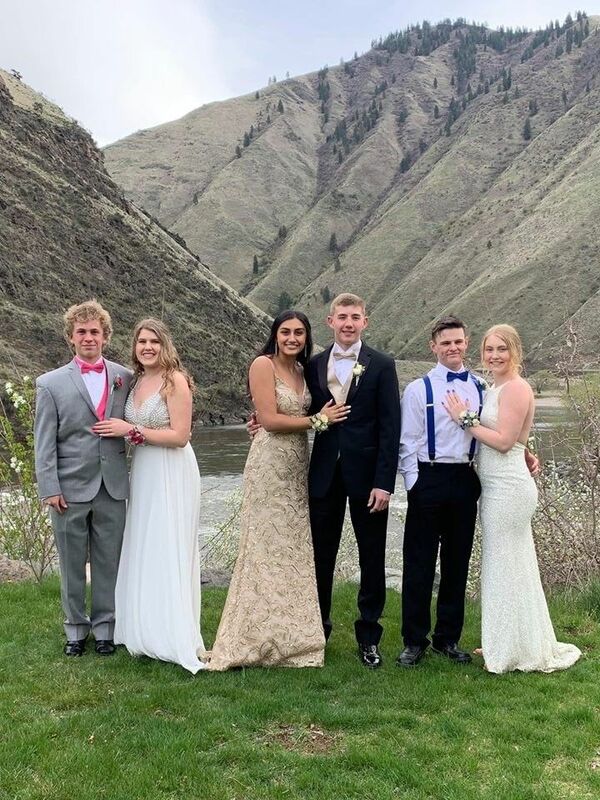 Some of the couples enjoying Riggins prom this weekend included (L-R) Justin Whitten, Sofie Branstetter, Emily Diaz, Craig Adams (Caldwell High School), Chase Alford (Horseshoe Bend High School) and Lotus Harper. Salmon River Junior/Senior High School was nominated and selected as the Best School in Idaho County. Congratulations, students, teachers, parents, aides, bus drivers, custodians, cooks, and patrons of the Salmon River canyon. Jet Boat weekend is here! The Annual Salmon River Jet Boat Race is this Friday, Saturday, and Sunday, April 19-21. Racing teams and past champions from Canada and USA will compete on the Salmon River of No Return Saturday and Sunday. Friday night will feature the annual barbecue at the Salmon Rapids Lodge at 6 p.m., where the jet boats will be on display for all to check out. Race action begins Saturday morning at 10 downriver; upriver at 10:45 a.m., followed by lunch. Leg 3 at 1 p.m.; Leg 4 at 1:45 p.m.; Leg 5 at 2:30 p.m.; Leg 6 at 3:15 p.m. The fireworks show will be Saturday, April 20, at dusk, in the Riggins City Park. Sunday action begins at 10 a.m. with Leg 1; Leg 2 10:45 a.m.; Leg 3 11:30 a.m.; Leg 4 12:15 p.m. Ceremony of awards will follow at the Riggins Community Center. Musical entertainment with Carter Freeman will be Saturday, April 20, from 4-7 p.m., in the orchard at the Idaho Banana Co. No charge, just a fun time for all. Easter celebration for Salmon River community is this Sunday, April 21, at 8 a.m., at the SRHS football field. Pastor James Dunn and Pastor Mike Chapman will be co-pastoring this celebration. There will be a special kiddos activity for kiddos up to fifth grade. Bring muffins or fruit for a continental breakfast following the service; juice and coffee will be provided by the churches. Everyone is welcome. 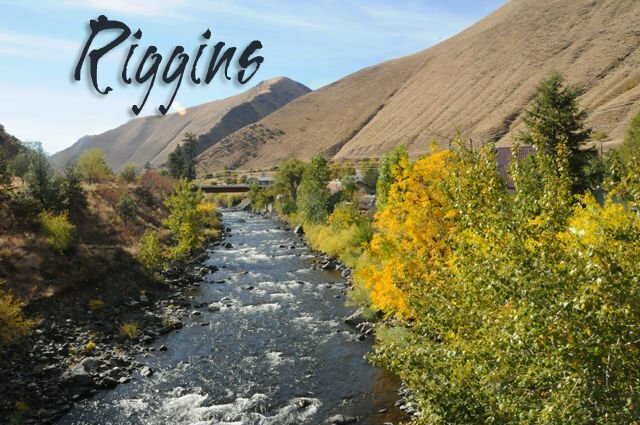 This will be the only service for both churches; enjoy the Salmon River Jet boat races start time 10 a.m.
Easter Egg Hunt in Riggins sponsored by the PTO and Riggins Elementary teachers will be held at the Riggins Elementary School this Saturday, April 20, beginning at noon with yours truly as the emcee. There will be four divisions, birth-2 years, 3 years-kindergarten, 1st and 2nd graders, and 3rd-5th graders with many, many eggs in each division as well as great special prize eggs. Each participating child will receive 50 cents as well as prizes and money in eggs as well as special prize eggs in each division. Pinehurst Quilters Quilt Show is this Saturday, April 20, at the upper level of the Riggins Community Center from 10 a.m.-5 p.m., with a $3 admission fee. They will have an array of quilts made and displayed by Pinehurst quilters as well as a featured quilter displaying her quilt pieces. Two quilts will be offered as raffle items; one winner will be announced Saturday, April 20; the other will be announced at the Cancer Walk May 18. Bingo is tonight, Wednesday, April 17, at the Riggins Community Center, beginning at 6 p.m., with the new game “Queen of Hearts Progressive Raffle.” Regular Bingo will start at 6:30 p.m., for everyone 18 years old and older. Come on out and check out the new game and have a fun evening with neighbors and friends…and help our senior citizens get their transit bus paid off. Reece Jones and Abby Folwell were crowned king and queen of the Salmon River High School 2019 Prom with Johnathan Swift and Trysta Ledgerwood as prince and princess, Saturday, April 13. All the prom-goers report a great time. Ward Hall, Riggins Rodeo Grand Marshall, along with Rodeo Queen Brittany Benavides and Princess Elli Klapprich will lead the 71st Riggins Rodeo, “How ‘Bout Them Cowboys!” Rodeo will be held May 4 and 5, 2019 with shows starting at 1:30 p.m. MST each day. Cowboy Breakfast will be held Sunday morning at the Riggins Community Center from 6-10 followed by the Riggins Rodeo Parade at 11 p.m.
Rodeo decorating contest! Decorate your home or business for the Riggins Rodeo and/or enter a float in the parade…the theme is “How ‘Bout Them Cowboys.” Message Joni or text 208-859-4725 to be put on the list for the judges who will be judging Friday afternoon after 2 p.m., May 5. Winner will receive four rodeo tickets and two rodeo T-shirts. Parade begins at 11 a.m. with lineup at 10 a.m. First place will receive three rodeo tickets and three T-shirts. Judging will be held during the parade. Riggins kindergarten screening and preregistration for both kindergarten and preschool is this Friday, April 19, at Riggins Elementary School from 9-11 a.m. Call 208-630-6055 to make your appointment. Rattle the Canyon and Dedicate the New City Park Stage in the Riggins City Park Saturday May 25. Park opens at 2 p.m.; tickets $20 per adults; free for those younger than 12. American Bonfire will perform 3-5 p.m., Muzzie Braun from 5-7 p.m., and JR & the Stingrays from 7-10 p.m. There will be beer, wine, and burgers. No coolers; no dogs. Leighton Vander Esch News: Leighton has a LVE Fan Group for all fans who appreciate the player and person Leighton is on and off the field. Welcome and show LVE some love. It is a closed group; anyone can find the group and see who runs it. Only members can see who’s in it and what they post. LVE Fan Group has 1.9K members which was created Nov. 21, 2018.